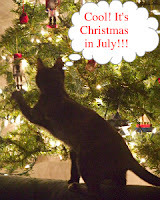 There are only 3 days left to enter the Christmas in July giveaway over at my Christmas blog, The Christmas Spirit. There will be two winners...one for each book. Up for grabs are The Christmas Sweater by Glenn Beck and 'Twas the Night Before by Jerry B. Jenkins. Giveaway ends on Saturday, July 31st at 11:59 pm. Click here to go to the original post for details and to enter. Oooo I would love the Glenn Beck book!